Take I-95 South to I-495, exit 6A. Take I-495 South to Exit 9, Bay St. Take Exit ramp and turn right onto Bay st. Travel 1.7 miles and turn right onto Bassett St. Continue straight 0.5 miles onto Fremont St. Travel another half a mile and Fore Kicks Complex will be on your left hand side. Take I-95 north to I-495 South. Follow I-495 South to Exit 9, Bay St. Take Exit ramp and turn right onto Bay st. Travel 1.7 miles and turn right onto Bassett St. Continue straight 0.5 miles onto Fremont St. Travel another half a mile and Fore Kicks Complex will be on your left hand side. Take Route 3 to either Route 44 or Route 25. Follow either route to I495 North. Merge onto I495 North to Bay st. Exit 9, Bay St. Take Exit ramp and turn leeft onto Bay st. Travel 1.7 miles and turn right onto Bassett St. Continue straight 0.5 miles onto Fremont St. Travel another half a mile and Fore Kicks Complex will be on your left hand side. .
Take Mass Pike to I-495 South to exit 9, Bay St.Take Exit ramp and turn right onto Bay st. Travel 1.7 miles and turn right onto Bassett St. Continue straight 0.5 miles onto Fremont St. Travel another half a mile and Fore Kicks Complex will be on your left hand side. 175,000 Sq. Ft. Indoor Sports Megaplex Building! Custom designed high bay clear span metal building featuring 11 indoor sport fields on 3 different surfaces including state of the art synthetic grass turf, artificial non-rubber infill turf surface and olympic quality Taraflex gymcourt/futsal courts. Multiple sports including indoor golf driving range, boarded and non-boarded soccer, Futsal, lacrosse, field hockey, basketball, volleyball, golf, flag football, ultimate frisbee, baseball, softball and more. All fields are available year round for rentals as well and are Fully Air Conditioned for year round comfort! 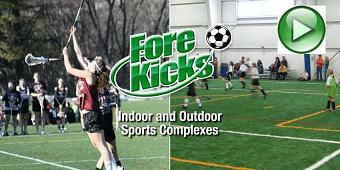 Our OUTDOOR sports complex is unique in New England featuring FOUR fully lighted synthetic grass turf fields permanently lined for soccer, field hockey, and lacrosse. Fields also lined for 8v8 soccer fields or 6v6 soccer fields for ultimate flexibility in game play and training needs. 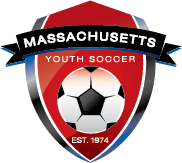 State of the art Musco lighting system, synthetic grass, player and spectator seating areas, restroom plud indoor and outdoor concession facilities makes this complex one of the finest outdoor sports venue in New England. Including FREE WIFI Internet throughout facility for our customers, Elevated Spectator's Observation Lounge, Large Screen Televisions throughout facility and private player showers and changing rooms. Featuring over an 8000 square feet of inflatable slides, obstacle courses, bounce houses and arcades for the whole family to enjoy while at Fore Kicks or for your own special party. Now siblings can have something to do while parents are watching games. Also available for private parties and birthdays. The convenience of our own onsite, fully stocked athletic store featuring quality golf, soccer, lacrosse and sport equipment, accessories and footwear at great prices. Under Armour, Callaway Golf and Warrior Lacrosse footwear and accessories are just some of the brands featured. Our Cardio and Strength Fitness Center will featureing a full line of top of the line strength machines and cardio equipment including the new CYBEX Arc Trainers plus Smith Machine and free weights area. Facilities include an air conditioned elevated spectator lounge and observation deck, fully catered banquet facility and function rooms for up to 500 people, our "Snack Shack" for refreshments on the go, plus our "10th Hole" restaurant eating area featuring favorite fast foods, drinks and snacks. Shaded 5000 square foot outdoor courtyard area adjacent to our 10th hole concession area for Fore Kicks players and specatators to enjoy a respite betwen games and relax with some refreshments. A separated dedicated Snack shack Express window convenient to fields for a refresshing drink or snack is also available. Available for birthday parties, teams, companies, organizations and groups for various functions and corporate events up to 500 people. Over 5000 sq.ft. of air conditioned function room space is available plus multiple meeting rooms. Full catering service, and other amenities are available. Featuring state of the art instruction, and clinics covering multiple sports and programs including golf, soccer, field hockey, lacrosse, football, basketball, volleyball, baseball/softball, personal fitness, personal health and wellness programs (Yoga, Tai Chai, etc) and more. Fore Kicks's nationally acclaimed Lil Kickers, Lil Sluggers, Hoopla and Lil Sticklers programs are ideal to introduce and develop children from 1.5 years in multiple sports and athletic development.